Strikeforce previously dubbed their May 2010 event “Heavy Artillery” because it featured a pair of heavyweight shootouts. Apparently, the UFC should steal that title from their little brother. 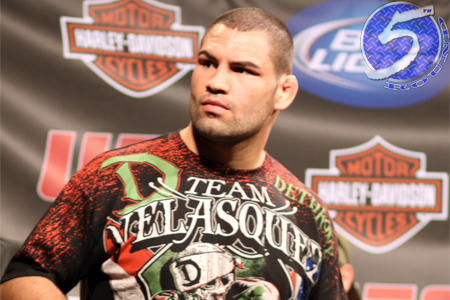 One day after announcing 265 pound champ Junior dos Santos would headline UFC 146 opposite Alistair Overeem, and minutes after confirming Roy Nelson would battle Antonio Silva in another heavyweight affair in the May 26th card, a scrap between Cain Velasquez (Pictured) and Frank Mir was also added to Memorial Day weekend extravaganza. Velasquez was last seen losing his hardware to dos Santos in November. The 64 second knockout loss is the only blemish on the 29-year-old’s résumé. Mir, meanwhile, continues his ascent back up the totem pole. The former champion has rattled off three consecutive victories. The victor of the showdown will be anointed the heavyweight division’s top contender. MGM Grand Garden Arena in Las Vegas, Nevada hosts the festivities.